John Deere has recently announced updates to its 944K Hybrid Wheel Loader, providing customers with the highest possible value. The addition of Final Tier 4 engine technology ensures that operators are able to make the most out of their fuel economy by minimizing downtime. Additional equipment updates include an increase in coast control performance as well as a heated and ventilated cab seat for maximum comfort. 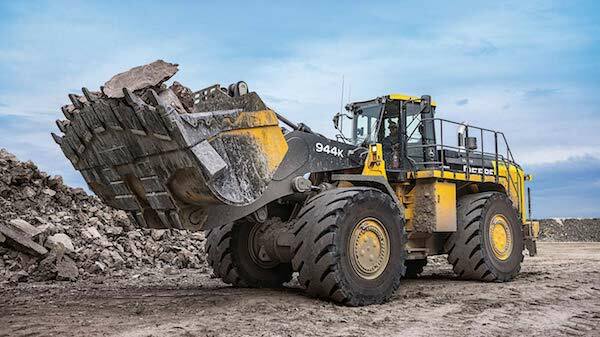 In light of these updates, let’s take a further look at the features of the 944K Hybrid Wheel Loader and see what this piece of equipment can really do! Updates to the 944K Hybrid Wheel Loader’s engine allow customers to enjoy nine to 14 percent lower fuel consumption than that of its IT4 predecessor. In addition to fuel savings, this engine also delivers excellent torque, ensuring good boom and bucket speed throughout any task. Thanks to a flow-sharing hydraulic system, operators will experience the fastest cycle and boom-raise times in the 944K’s size class. Additionally, each boom and bucket function has its own hydraulic pump, allowing for a smooth operation and maximum productivity. With an engine that runs at a choice of three constant rpms, as selected by the operator, boom and bucket functions remain as powerful and responsive as possible and machine noise is reduced. The 944K Hybrid Wheel Loader has a hybrid-electric drive feature which recaptures energy to slow the machine once the operator lets off the accelerator – this reduces fuel consumption by lessening the load on the engine. The Quad-Cool design increases the efficiency and durability of this machine by placing coolers in a boxed configuration that is sealed off from the heat of the engine. Operators have the option to adjust the aggressiveness of the machine when slowing down with three different settings – the higher the setting, the more electric braking will occur. Thanks to this feature, service-brake component wear will be reduced. Designed to maximize productivity with an upgraded engine and comfort features, the John Deere 944K Hybrid Wheel Loader ensures that every job is completed as efficiently as possible.